RHOHMAN, Fatkur; SUBANDRIYO, Susdi; ISTIQLALIYAH, Hesti. Analisa posisi derajat tonjolan magnet (trigger magnet) pada konsumsi bahan bakar. 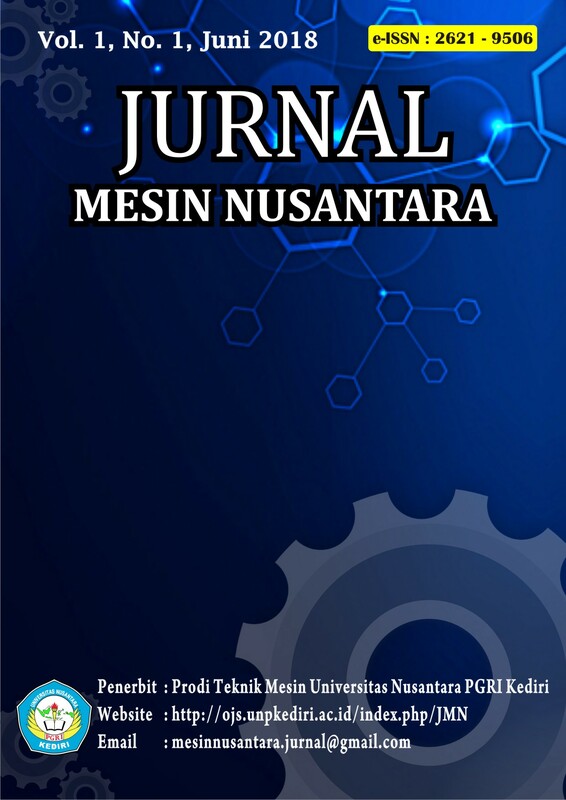 Jurnal Mesin Nusantara, [S.l. ], v. 1, n. 1, p. 42-50, june 2018. ISSN 2621-9506. Available at: <http://ojs.unpkediri.ac.id/index.php/JMN/article/view/12295>. Date accessed: 24 apr. 2019. doi: https://doi.org/10.29407/jmn.v1i1.12295. Young, G.O. 1964. Synthetic structure of industrial plastics (Book style with paper title and editor) in Plastics, 2nd ed. vol. 3, J. Peters, Ed. pp. 15–64. New York: McGraw-Hill. Chen, W.K. 1993. Linear Networks and Systems (Book style) pp. 123–135. Belmont, CA: Wadsworth. Poor, H. 1985. An Introduction to Signal Detection and Estimation. ch. 4. New York: Springer-Verlag. Machmud, S., Untoro, B, S., Leydon, S. 2013. Pengaruh Variasi Unjuk Derajat Pengapian Terhadap Kerja Mesin. Jurnal Teknik. 3 (1):58–60., Yogyakarta, Fakultas Teknik Universitas Janabadra.